Here’s a set of cards I made with Joyful Season. I started, actually, with this one, which is more the mid-level card. Anyone here married to an engineer? I am. He’s also a writer (fiction and non-fiction), but I guess his creative side only translates to the written word. I showed him this card, and the first expression on his face was, “Wow, that’s ugly.” He said, “It’s… uh… I don’t get the torn paper thing.” He later told me that he almost said, “Oh, is this one of BC’s cards?” Our five-year-old daughter. I’d thought he might think it was one of my better ones; it’s masculine, fairly simple… Haha, NOPE. I told him he doesn’t understand art, and SO’S YOUR FACE. Next I made this one, the Craft Hard card. 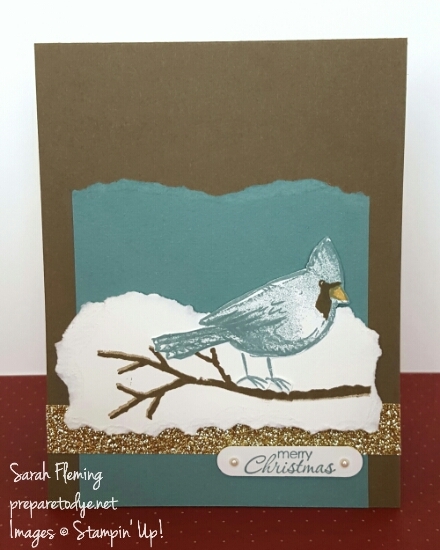 Added the vellum, changed the colors, added more stamping, popped the bird up on dimensionals. That vellum is from the Winter Wonderland Vellum Stack. So pretty. Finally I made this one, the clean and simple version. The Ain’t Nobody Got Time version. This actually turned out to be my favorite of the three. I did the extra stamping that I’d done in the Craft Hard version but took away all the layers. Added the twine and two sequins from the PLxSU Hello December Accessory Pack, and I’m done. I love white cards for winter. They just look so crisp. 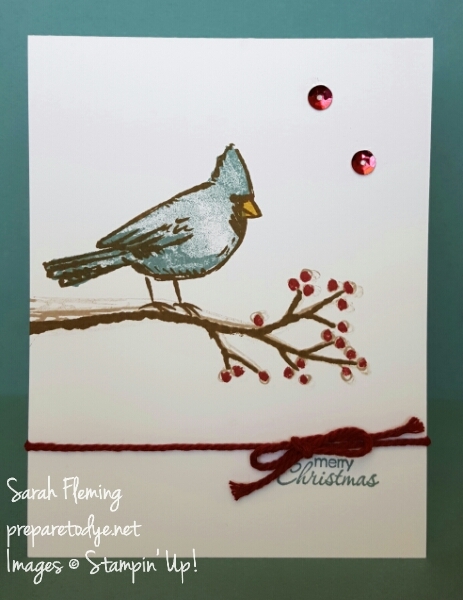 That Merry Christmas stamp is my very favorite Stampin’ Up! stamp, current or retired; in fact, my friend used it at the first stamp camp I attended in 2011, and I’m pretty sure it was my first purchase. It’s from Petite Pairs. 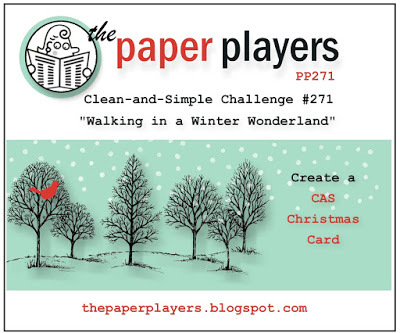 I’m entering this version of the card in the Paper Players CAS Christmas challenge. Did you notice your branch can go either way? Just turn the stamp. Oh Sarah these cards are just lovely! 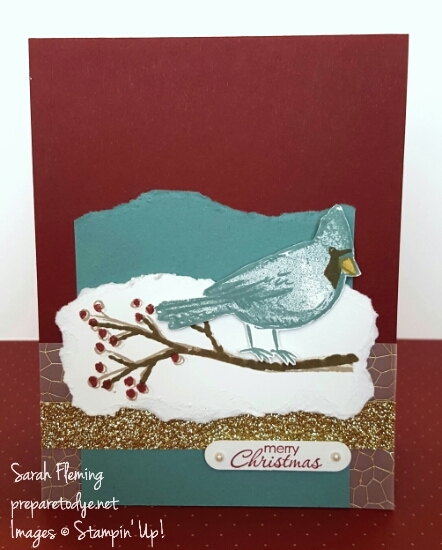 That cardinal is a real beauty, and the torn paper combined with the glitter paper adds so much texture. Thanks so much for joining us this week at The Paper Players! 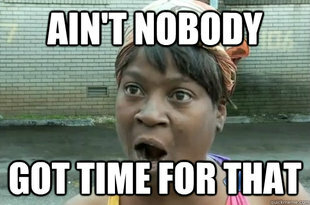 PS: Your “Aint Nobody Got Time” cracks me up! So true! So pretty! Love your little bird with the layering under it. Perfect CAS card for the holidays! Thanks for joining us at The Paper Players, hope to see you again soon!